Remodeling or building a new home? Butler Home Improvement offers professional vinyl siding installation. Butler Home Improvement’s professional siding replacement contractors in St. Louis and Illinois work with area homeowners and property managers to improve the quality, efficiency, and value of their homes and establishments. Our services extend to complete interior and exterior renovations in addition to siding installation. Our team helps clients realize the various benefits of new vinyl siding, which products to choose, and how to replace siding under budget. Butler Home Improvement is here to assist homeowners throughout the St. Louis and Illinois area choose siding that matches your ideas and look for your home. We understand the strain homeowners go through when it comes to maintaining wooden siding, which is why we offer vinyl siding installation that not only protects your home, but increases its value. Rain, wind, hail, UV rays? No problem. Vinyl siding is extremely durable and weather resistant. Combined with good insulation, vinyl siding helps reduce utility bills by keeping your home warm and dry during the winter and cool in the summer months. Butler’s interior and exterior services, including bathrooms, kitchens, decks, and sunspaces, are just a few services we offer home and property owners in Missouri and Illinois. Butler Home Improvement’s excellent reputation is backed by the projects we’ve completed for homeowners. Check out our interior and exterior gallery to see what we’ve done for homeowners in the past. What is your price range/budget? Choosing a budget is never easy for homeowners considering the unknowns with any home renovation project. Fortunately, Butler Home Improvement’s siding contractors offer free quotes, financing options, and other programs to help you with pricing. How do contractors fit into vinyl siding installation? A lot of homeowners prefer to renovate homes themselves. This is all good and fine if you know what you’re getting into, but remember the costs and potential problems that could come about from low-quality work. Remodeling experts like those at Butler Home Improvement are here to help homeowners through the entire process. Who actually does the installation? Butler Home Improvement is comprised of qualified, experienced interior and exterior construction professionals. Our track record, associations and accolades, and White Glove Service prove our team is right for any job. So what do I do after my siding? 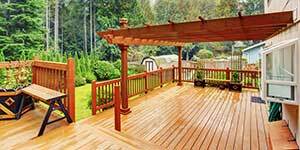 Being seasonal, exterior remodeling opens up a lot of opportunities during the warmer months of the year. Think of projects in groups — Ok, I want to install new siding, what else can I do to improve the value and look of my home? Our other exterior renovations include decks, sunspaces, and windows. We also offer Handyman Services as well as kitchen remodeling. Where do I begin? Once you decide to install vinyl siding on your St. Louis or Illinois home, reach out to the experts. Contact Butler Home Improvement or request a free quote to learn more. It’s very important for home and property owners to ask questions and do their research before installing siding. A few good places to start would be, How long will it take to complete the project? What options do I have in terms of brands, colors, and material? What can I do if the quote exceeds my budget? The vinyl installation pros at Butler Home Improvement have the answers. For more than 20 years, the Butler team has provided its customers with easy, hassle-free interior and exterior contracting services. We take a realistic approach to any project you may have because we understand the strain of, say, a bathroom or kitchen remodeling project has on you, your family, and your wallet. We concentrate on giving homeowners professional advice alongside free quotes to make sure your siding replacement goes off without a hitch. Butler Home Improvement offers siding installation to clients throughout Missouri and Illinois. A handful of cities include St. Louis, St. Charles, O’Fallon, Edwardsville, Belleville, Collinsville, and others. Contact us now to learn more! Our project management system is impeccable. Butler’s contractors include only the most knowledgable pros in the industry. We work hard to exceed our client’s expectations when it comes to all of our projects, especially siding replacement and installation, and to prove our commitment offer hassle-free estimates and two-year warranties. Butler Home Improvement, a woman-owned and independently-operated company since 1996, serves homeowners and businesses throughout the greater St. Louis area. Our interior and exterior remodeling services are supported by the best products and talent in the industry. Our team of highly-skilled contractors are proud to deliver their best through our White Glove Service and The Butler Advantage. To learn more about siding installation in St. Louis and Illinois, contact us today at (314)329-5489 or read these online reviews. Dear Butler Home Improvement, We are very pleased with the siding. Jeff and Steve are to be commended. They worked steady, in a professional manner, paid attention to details and the quality of their craftsmanship. They listened to any concerns and made every effort to address the issues. Your product is good, but the whole crew made the difference that sets you apart from the others. I will most certainly recommend Butler Home Improvement to everyone!